Fishermen swear by all sorts of lures and jigs to land a prize-worthy catch. Most serious anglers have a few pieces of hardware they especially trust. 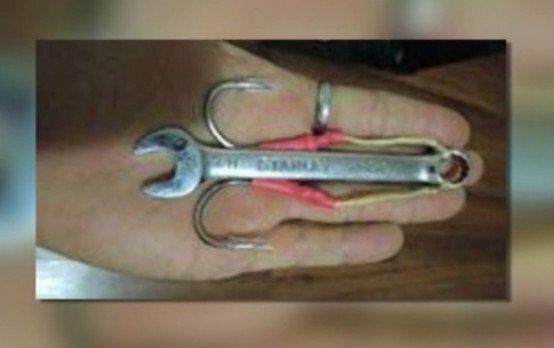 One Florida man decided to construct his own jig out of a hand wrench, and boy did he have results. After just a few tugs on the line, Ryan Hein from St. Petersburg, Florida hooked a 400 lb. goliath grouper on none other than a #11 wrench. Tired of spending up to $20 on fishing jigs, Hein wen to his garage in search of something that might work. So he attached two hooks to one end of the wrench where he also attached the line. Hein said he did it more as a joke than anything else, not really expecting to catch anything. But on the first drop and just the third tug, he got a pull on the line like nothing he had ever felt. Amazingly, the rod and 50 lb. test held up in pulling in the monster fish. Hein had to jump in the water just to remove the hook, along with a few other from previous encounters, and set the fish free. Next up, Hein said he wants to experiment with other household objects like a fork and butter knife.